Two desserts , one recipe . BINGO! yes you read that right .A recipe for a melting airy chocolate mousse and a 100% successful chocolate soufflé . Do you have that thing sometimes when your mind just start obsessing about a particular idea for days and it wont let you even think of anything else until you execute that idea ? well at least i do and this recipe was one of those ideas that kept buzzing in my head for days and eventhough i was a bit lazy to give it a try i ended up by stop resisting and just do it ! Chocolate is a perfect fantasy material for any dessert recipe developer because of it's simlicity to combine with endless flavors . Chocolate can be the star of the show in any recipe as it can play an inhancing role to make some other flavors pop like the Milkchocolate with Tonka beans or passion fruits combination . I mean don't get me wrong when i say it is simple to integrate into recipes but at the same time it can be technical to handle if you wanna really step up your game and try more sophisticated recipes . But if we start with mastering some of the classic recipes based on chocolate we can adapt them to an endless range of goodness . And some of the basic chocolate recipes i grew up eating are chocolate mousse and chocolate soufflé. As simple as their ingredients list seems to be as tricky they are to execute perfectly . but don't be afraid you will end up anyway with an endless chocolaty goodness even if the result is not perfect or pretty . 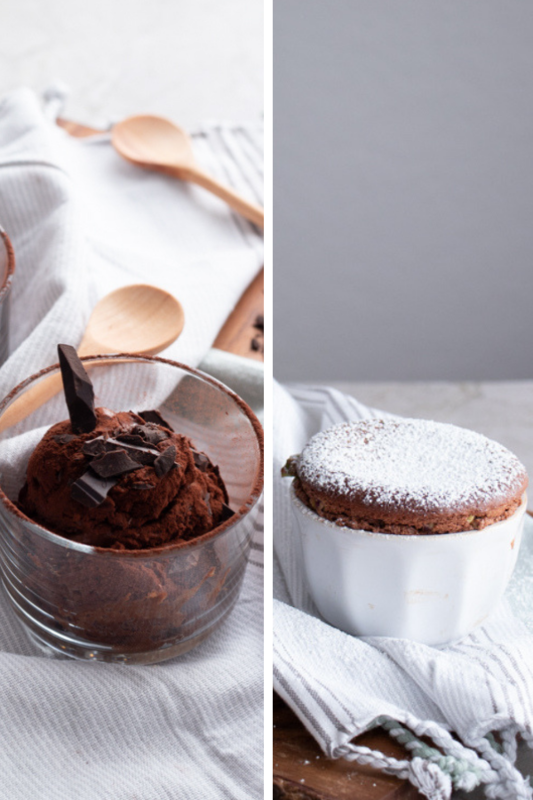 The basic ingredients of both chocolate mousse and chocolate souffle are : chocolate , eggs and sugar , that's it . Trust me ! Well the secret to sucess for a melting and fluffy chocolate mousse and soufflé is egg whites . I think that was no surprise as it is the base of any mousse like texutred recipe and it's what decides its airiness . As in any recipe involving egg whites the key word is Be GENTLE ! and don't over mix the egg-whites or break them when stirring in the melted chocolate mixture . Tip : Always fold in the eggs with a spatula from the bottom to to top GENTLY! until all of the egg white is integrated with the chocolate mixture . I will start by giving you tips about getting that dreamy Chocolate mousse. Use good quality chocolate , i prefer my mousse with dark chocolate but the sky is your limit when it comes to chocolate choice . The only advice i will give you is , pick a chocolate that you enjoy eating by it's own and don't use the cheap baking chocolate blocks you find in the baking sector of your grocery store . Let the melted chocolate cool down a little bit before adding in the egg yolks and don't forget a pinch of salt to enhance the richness of chocolate . This will ensure that your egg yolks won't cook and ruin the the smooth texture of your chocolate mousse . Leave your chocolate mousse rest in the fridge overnight . I know it's so hard to resist digging into it right away but trust me it worths waiting . Actually giving the chocolate mousse enough time to chill and rest will help form that airy and fluffy texture . Avoid placing the chocolate mousse in the freezer to speed up the setting phase ! chocolate will harden and you can never reverse the damage of that in any way . I've done this once and my chocolate mousse was ruined . Now let's talk about the chocolate soufflé . Again like for the chocolate mousse Use good quality chocolate . Preheat you oven on 200 C then turn it down to 180 C when you start baking . Grease your ramequins , then dust them with flour or cacao powder and let them in the fridge for at least 15 mins so the butter solidifies again. That will help the soufflé rise. Eat your chocolate soufflé warm ! it is the best way to enjoy the liquid center and you can add some "créme anglaise" or a scoop of vanilla icecream on top to cool it down faster and just devour it out of the oven . OUPS ! yeah most of the time i can't wait till they cool down a bit i just dig in and burn my tong hence the icecream or creme anglaise Tip . Don't judge me try baking them by yourself and you will understand what i am saying . Extra Tip : One extra tip , if you want to pimp your chocolate souffle you can sprinkle some nuts after greasing your ramequins and when they will bake and rise they will form a nice decoration around it . I used some pistachios but you can not see them on my picture since they dropped down while i was preparing my shooting setup . Because Chocolate souffle loose their volume very quickly after getting them out of the oven so you need to serve them right away if you want to impress your guests and family . Disclaimer : these are the steps for both the chocolate mousse and chocolate soufflé . Beat you egg whites with a pinch of salt then sugar until you get a stiff pick . Melt the chocolate , let it cool down a little bit then add in the egg yolks . Fold in the chocolate mixture into the egg whites . Now if you want a chocolate mousse reserve the mixture in the fridge over night . And if you want a chocolate souffle bake your mixture in a 180 C preheated oven ( check the first tip about the oven preaheating ) for 15 mins until they pop out of the ramequins and look beatiful and high. A full time sweet tooth foodie , foodphotographer and recipe developer who is always on the hunt of new flavor combinations and food discoveries to re-create sweet delicacies and fresh dessert recipes . Copyright © 2017 Chocolate free website, proudly powered by Contentful and Gatsbyjs.